Picnic Day is an annual tradition in our family. We love visiting our old stomping grounds, letting Trevor explore all the different departments, try fun foods, and do the world's most horrifyingly awesome art project. Last year, I couldn't go because it fell during Snap Conference. This year, Steve couldn't go because he had a training he had to attend. We invited my mom to join Trevor and me. She hadn't been to Picnic Day since I was a college student many moons ago. Trevor has gone to Picnic Day and visited the UC Davis campus enough times that he was able to pretty much lead us around to all his favorite activities. 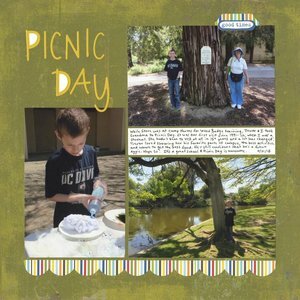 I kept the layout really simple - just three photos (featuring Trevor in his UC Davis shirt), a title, journaling, a border sticker, and an embellishment. I wish I'd been in a photo to at least document that I was there, but I didn't think to hand over the camera. I was wearing a UCD Alumni shirt; why didn't I think to have Mom photograph Trevor and me together in our coordinating shirts? We even talked about getting her UC Davis Mom, UC Davis Mother-in-Law, and Future UCD Davis Grandma shirts. It would have been a fun picture having her pose with the various options for sale on campus. Oh well. I'm grateful for the photos I do have. Beautiful! LOVING the pop of color with the border sticker!!!!!!!!!!! I had to click back and read about the art project. I thought it was going to be done with worms! Maggots...ugh. I really like the color scheme you chose for this page.